As ever with the craft, there are no fixed names for any of these products. In fact there seems to be more names than thatchers! The most important item any thatcher can possess, is a skilful pair of hands; combined with a good eye, to judge a straight line or the correct curve. The only maintenance needed, is constant practice. Gloves can protect hands, but the craft is often practised without them. Some thatchers make up a type of leather mitten, to protect the palm; most don’t… A part of the body, that always needs protecting are the knees. A good pair of knee pads are essential. The rungs of a ladder can play havoc, and housemaid’s knee is extremely painful. With these, the thatcher could reach the top of most jobs, in one go. These long giants are still to be found, gently mouldering away, on farms all over Britain. As they were used extensively, when thatching corn and hay ricks. 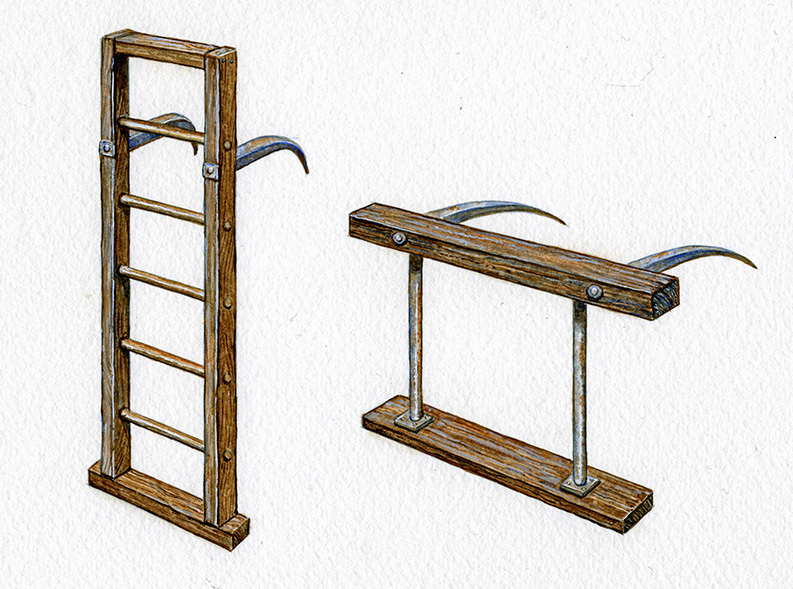 In 1709, the ‘Commons Warden’ of Shaftesbury, in Dorset; was instructed to purchase two pole ladders. ‘For use of the corporation in case of fire’… These were to be of thirty four rungs each. So the long pole ladder, goes back a long way. Most thatchers possess a long ladder, now usually a more mundane metal affair. These ladders have the huge advantage of being weather proof. Which is useful in an outdoor trade. As health and safety laws are extended, the days of the big ladder are probably numbered; scaffolding being increasingly required. But what to do if the long ladder doesn’t reach… Another smaller one could be tied to the top. 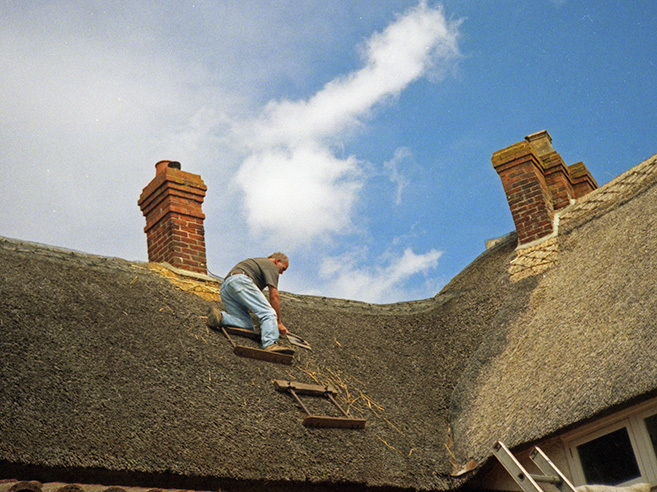 Or better still, use the advantage that thatch has, over every other roofing material. 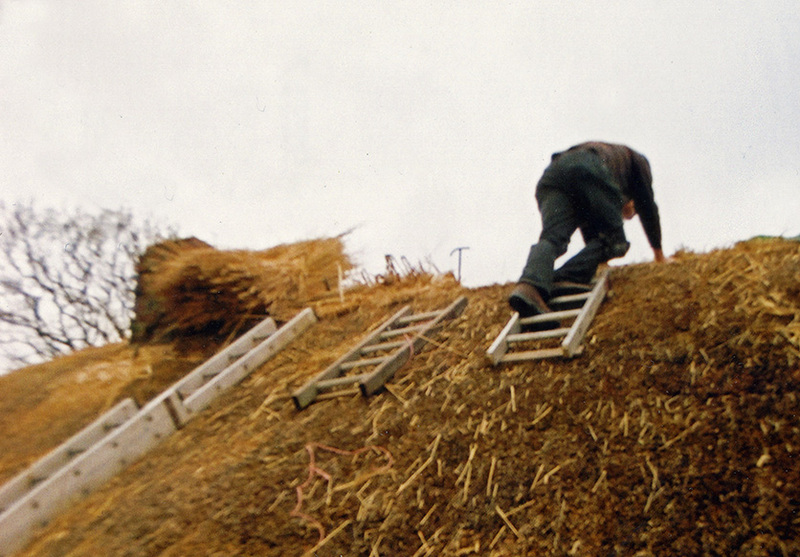 A thatched roof is not solid; the thatcher can stick things into it and stand on them! Over time, thatchers have developed some clever devices, to make full use of this fact. The names of the most common type, known as Hanging Ladders or Hangers, describes them well… These are short ladders, with metal spikes at the top, that stick in the thatched roof. Giving the thatcher extra reach. Another adaptation, often found in the West Country, is called a Biddle or Thatcher’s Horse. This has the metal spikes, fixed to a piece of wood; to which another section is suspended below… Allowing the thatcher to kneel on the top and stand in the bottom. The spikes on both types are around 15 inches (370mm) long. Usually blacksmith made. 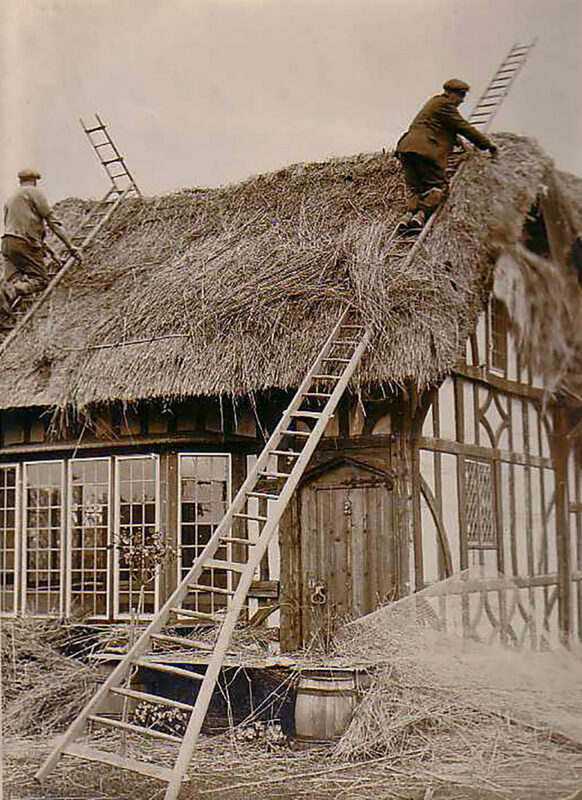 Standard thatching is put on in layers, the edges of which need to be held in place temporarily. The loose edge is often held by a Reeding Pin… These are smaller versions of the thatcher’s needle. Some thatchers use one, to hold back each and every layer, as it is formed. Others, just on the layer they are working on. Using a spar or long thatching crook to keep the edges of completed courses secure. Leggets are mostly made of wood. But use with water reed will wear this material away quite quickly. Some metalwork, can be fixed to the legget’s face, to slow this process down. This can take several forms. Pieces of metal curtain track, are used to create groves. Or thin sections of copper pipe, are stapled into place. And an old favourite; horseshoe nails with their heads flattened, are driven in lines, across the legget’s face. Some cast metal faces are also produced. But these can be heavy to use. 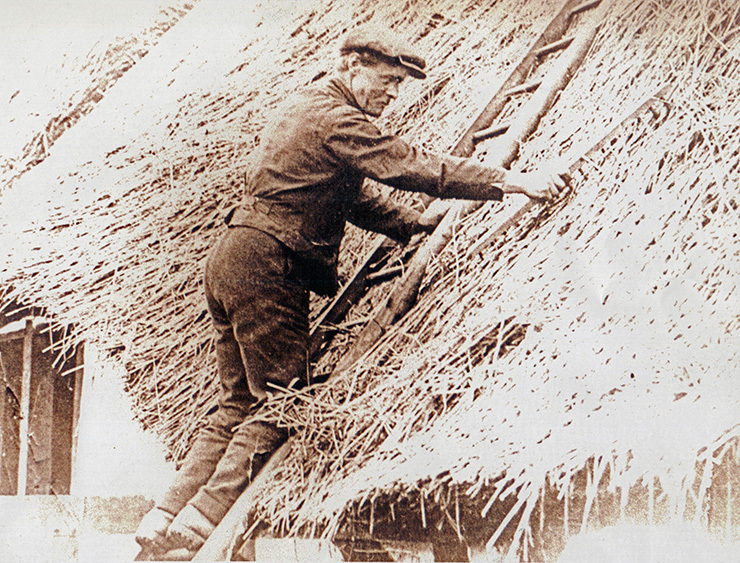 When it comes to awkward sections of roof, for example around windows and valleys, the reed thatcher often needs a smaller tool, to drive in the thatch. These are usually scaled down versions of the standard legget. A design imported from Holland is also used… A conical tapering shape with holes drilled in the face, known as a Dutchman. A basic Legget design. The angled handle keep the hands clear of the roof surface. 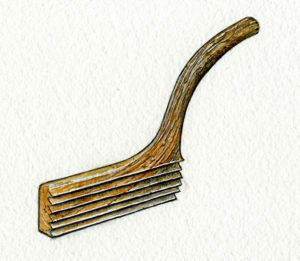 Notches in the handle, marking 15 and 18 inches (375mm and 450mm) of length, act as a measure; when setting an eaves out, over a wall or gable end. On the right the grooved wooden face of a combed wheat reed legget. 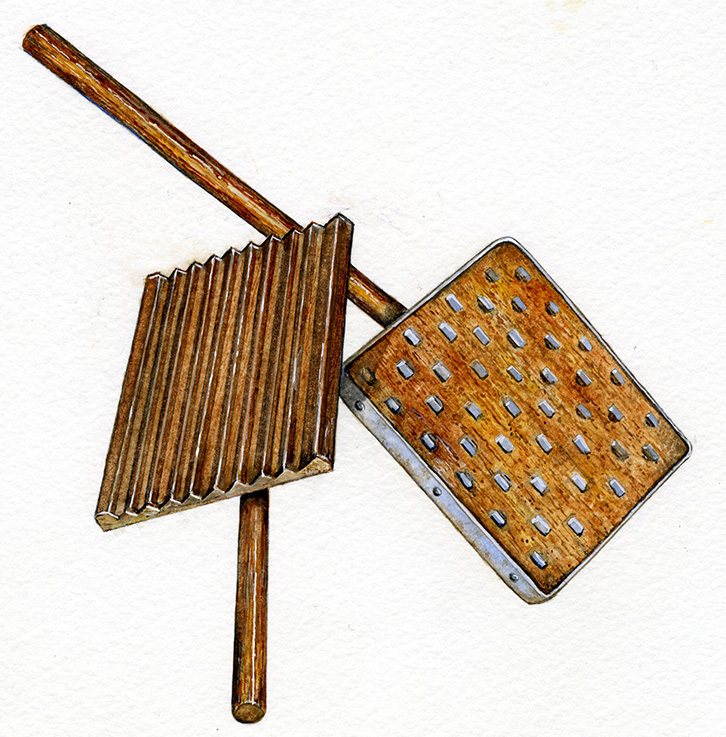 And the metal edged, water reed version. With horseshoe nail heads to do the driving.. The oldest image of a thatching tool is of a legget… Found buried, in a manorial court roll, from Crowle in northern Lincolnshire. Written for the year 1364. It is easily identified, as a splendid sketch; of a water reed legget. As remarkably, thatchers all over eastern England use similar tools today. A legget, is not required by the long straw thatcher. Who carefully lays the thatch, but does not drive it into position. The tool long straw thatchers use, to tidy the face of their work is, as ever, very simple… The Side Rake, is basically a length a wood, about 4 ft. (1.2m) long; just under half of which, is a shaped handle. 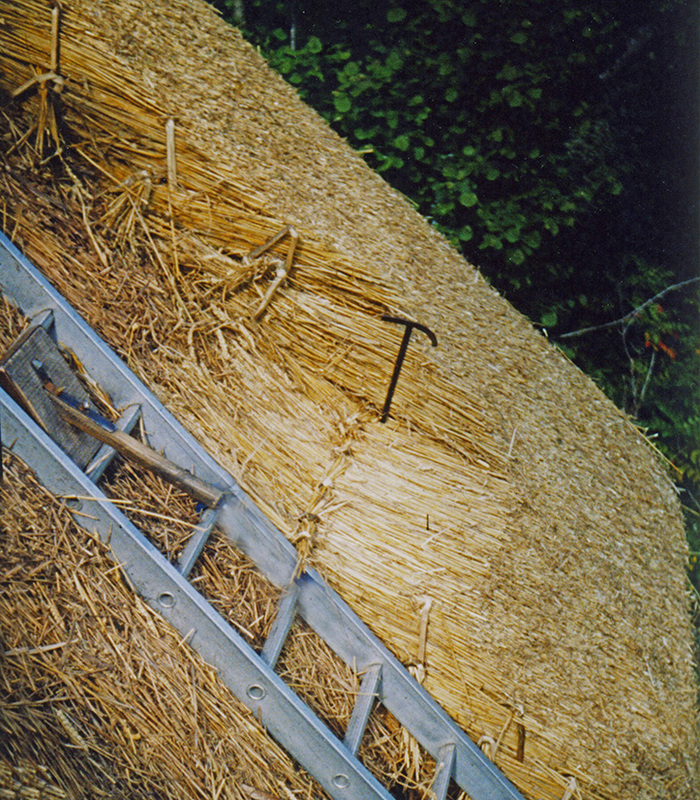 The rake section, is usually made from nails driven through from the top. The name sums up it’s use, as the thatcher rakes the roof clear of waste, from their side… Getting a good two handed purchase, from the long handle. The Side Rake… As with the legget, the handle is designed to keep the hands clear of the roof. But with this tool, it is always one of long straw. 1923 ,raking… As ever with the craft, there are always exceptions. 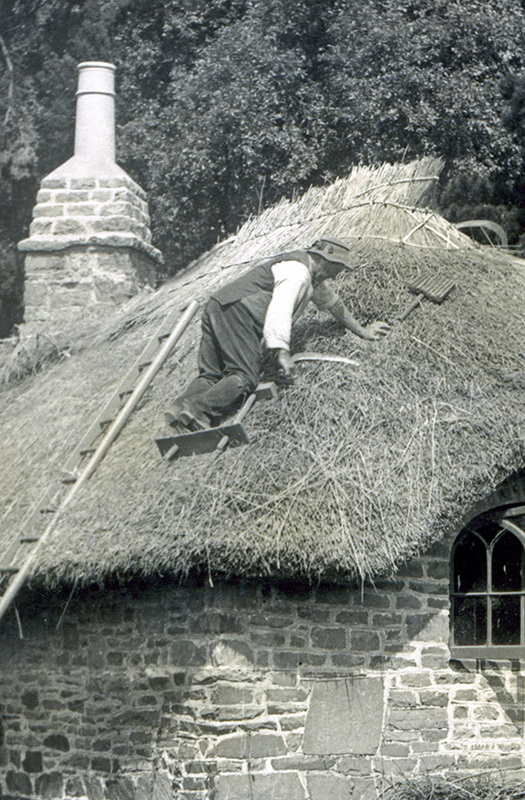 This Staffordshire thatcher, made use of the base of a wooden hay rake; when thatching Izzak Walton’s Cottage… Photo; courtesy Izaak Walton’s Cottage Museum. Edged metal hooks and knives, unique to the trade; have to be skilfully crafted and are never plentiful… Not surprisingly, the most difficult hook to obtain, is the most complicated to make. Coatwork in combed wheat reed, is often trimmed with a Shearing Hook. And flush type ridges, in the same material, also receive a shearing down, with this useful tool. At first glance it looks like a large reaping hook. But on closer inspection, it can be seen that the blade gradually turns to a steeper angle, as it moves away from the handle. This enables the thatcher to shave a thin layer off the face of the coatwork, by pulling the hook downwards and towards themselves: in a slightly circular motion. 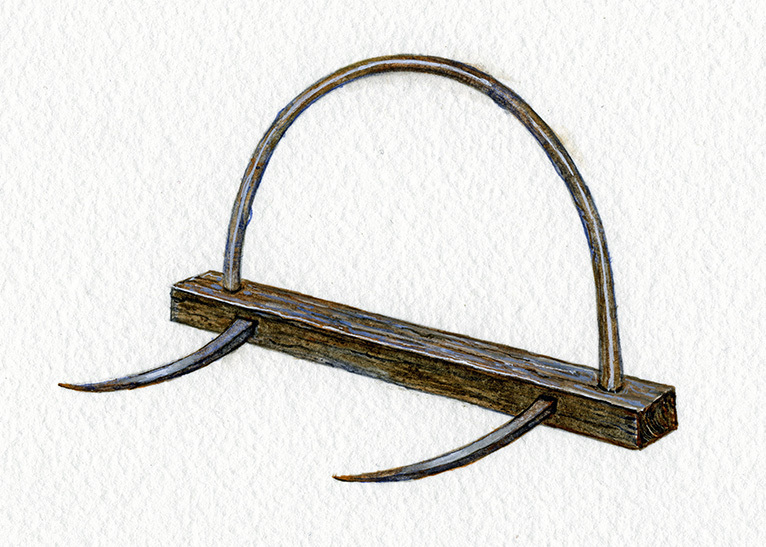 The Eaves Hook or Easing Hook, trims what it’s name suggests. This is very similar to a reaping hook. In fact many are used, for the purpose of cutting the eaves, of wheat thatch… But a true eaves hook is less curved than it’s reaping cousin. 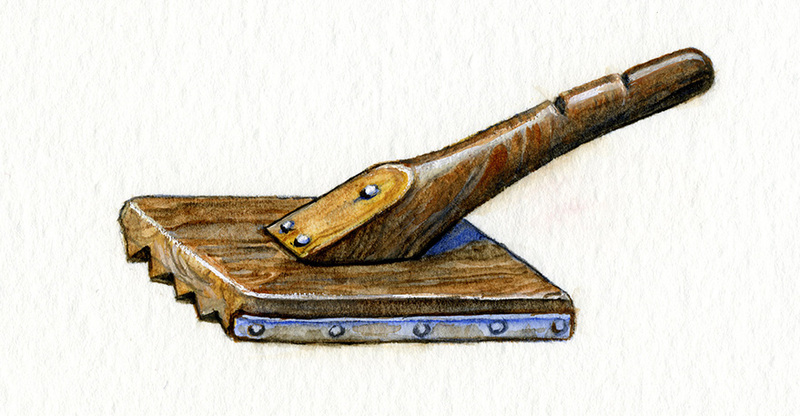 A shearhook can also be used, to trim the eaves. If turned upside down and used with a pulling action… Today, many thatchers use a good pair of garden shears, to the same effect. An edged implement that can be made, if not at home, then a least in the local forge; is the Long Eaves Knife… Many of these are fashioned, by straightening a scythe blade, at the handle end; and fixing it to a straight handle about 3 feet (900mm) long. This tool is used exclusively, in long straw thatching, to trim the gable ends. 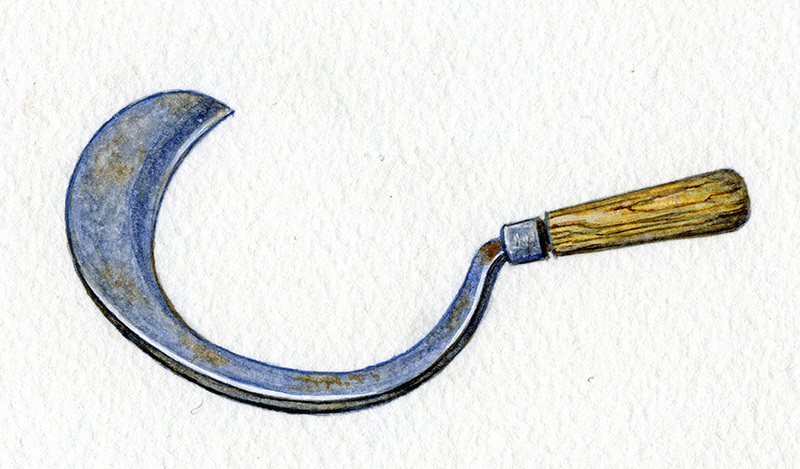 There is also a shorter version of this tool, not unsurprisingly called the Short Eaves Knife… These are useful, for both trimming long straw eaves and the over sailing tops of water reed; as the top of the roof is approached. As can be imagined, all these hooks and knives, are kept in a frighteningly sharp state; with some good quality whetstones. 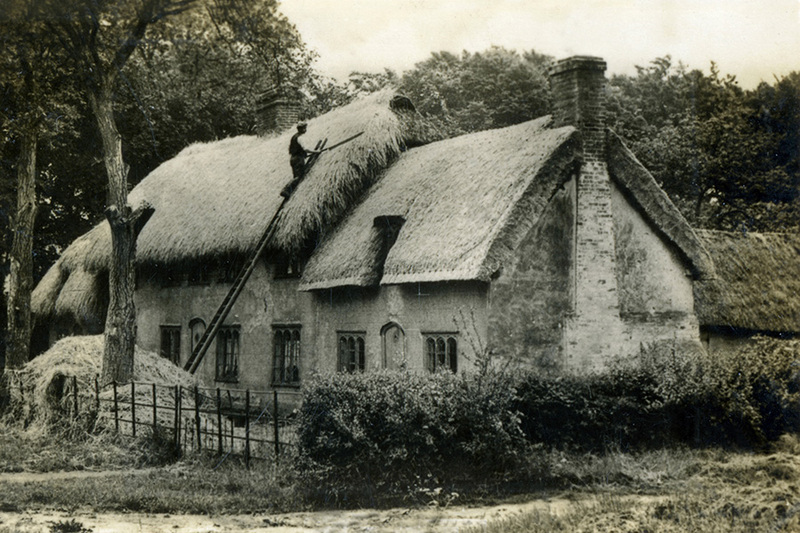 Trimming long straw gables… In Suffolk around 1930.